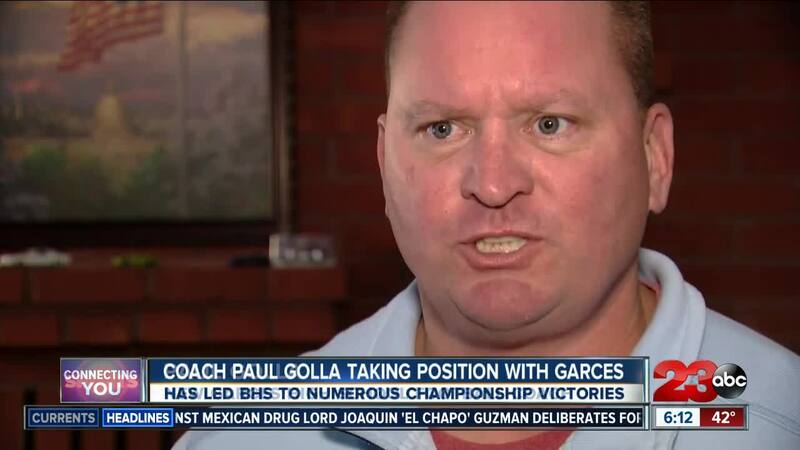 BAKERSFIELD, Calif. — Bakersfield High School head football coach Paul Golla has resigned and will be moving on to a new school. Golla confirmed to 23ABC that he will take up the head football coaching spot at Garces Memorial High School. Garces Memorial released a press release saying that they are honored to announce Golla as the new head coach of the Rams. Golla has coached on both the collegiate and high school level in Texas, North Dakota and California. Garces Memorial Principal Myka Peck released a statement on the addition the Garces family, stating they are beyond thrilled to welcome him. His commitment to his family makes it apparent that he will be an incredible addition to our campus. Garces is very blessed to have Paul Golla join our Garces family and we are very excited about the future of our football program.